Consider the Roundup the collective conscious of the old men sitting on their porch yelling for various things to get of their lawn, while at the same time yearning for "the way things used to be." Piped in hip hop music, get off our lawn. Yearlong recruiting cycle,hit the bricks. Alternate uniforms, get the hell out. ESPN cross promotion, not on our watch. You know what was great? Wishbone offenses. Those were great. total predictability, ruthless efficiency. Fullbacks. Remember fullbacks? Probably not. You kids are all into slot receivers and run ratios. With that preamble in mind, the Round Up wants to bring back one of the greatest rivalries in college football history, Nebraska vs. Oklahoma. 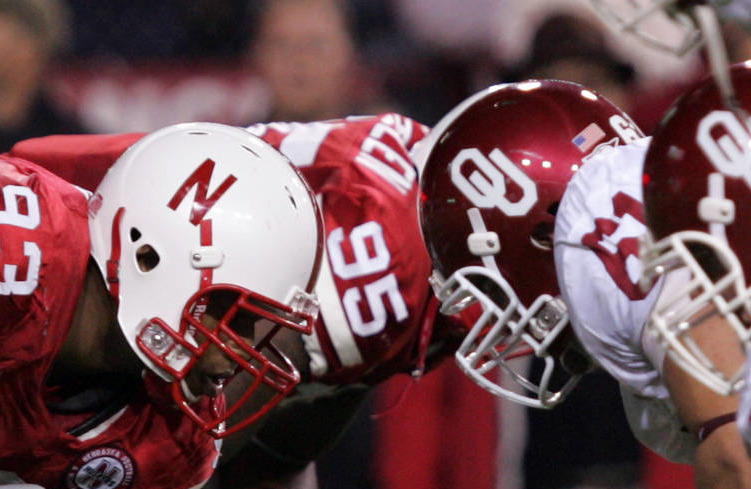 The Huskers and Sooners met 86 times from 1912 to 2010. Oklahoma holds a 45-38-3 lead. Twenty six of those meetings were between ranked teams, nine times between top five teams, twice between the top two teams in the county. Nebraska dominated the first 22 games of the series, winning sixteen and losing only three with three ties. Yes, there were ties in college football. No, the world didn't tilt off its axis. Oklahoma hired Dewey Luster in 1941, in '42 the Sooners began a string of 16 straight, This included the Bud Wilkinson era when the Sooners were basically unbeatable. In 1959 the Huskers finally turned the tied with an upset of the 19th ranked Sooners. Bob Devaney's hire issued a period of parody in the series, with the Huskers wining two national titles in 1970 and '71. The 71 Sooner/Husker game was known as the game of the century, you know, before the other games of the century later in the century. The Huskers beat OU that day 35-31 and went on to win the Orange Bowl over then No. 2 Alabama 38-6. Devaney retired in 1972 ushering in Tom Osborne which coincided with the Sooners' hiring Barry Switzer. Osborne and Switzer's annual get togethers in late November were must see TV. Switzer had a 12-5 series advantage over Osborne including strings of 5 straight and 4 straight wins. The Sooners won three championships under Switzer. Once Switzer left the Sooners, so did their ability to deal with the Cornhuskers for the next 11 seasons, the Nebraska held a dominate 9-2 advantage over their rivals to the south. Then the Big 12 showed up and f'ed everything up, as it has been prone to do. The Rivalry became a two years on two years off affair. The Sooners took control of these sporadic meetings and once Nebraska became fed up with Texas' strangle hold over the Big 12's purse strings, they bolted to the Big 10. A decision I'm sure they regret. Hey maybe someone can start a site to revive the Big 8. Check for the availability of big8roundup.com on godaddy. Oklahoma and Nebraska have signed up for a home and home series beginning in 2021. Two whole games. Awesome. We need the Sooners and Cornhuskers playing in the cold, in November, for middle American bragging rights. The shoe companies could make throwback tear away jerseys and other branding items. I know what you're asking; "how could Nebraska and Oklahoma play so late in the season when they're not even in the same conference?" I know, it's hard. How do Clemson and South Carolina pull it off? Or Georgia Tech and Georgia? Florida State and Florida? Dumber people have done the math. It can work. Play it Thanksgiving weekend and give both teams a showcase game on national TV. And no, no one cares about Bedlam. At least no one outside of Oklahoma. Play the Cowboys a week before or the week after. Oklahoma did it for 50 years. Before the Big 12 screwed it all up. Posted on November 11, 2015 by The Roundup and filed under Southwest Round-Up and tagged Renew the Rivalry Oklahoma Sooners Nebraska.